Barcelona played arguably their best starting lineup; with Valdes, Puyol, Pique, Adriano, Dani Alves, Busquets, Iniesta, Xavi, Messi, Villa, and Pedro all starting. While Real Madrid opted to change it up by dropping Kaka, Higuain, and Ozil to the bench. Barca kept their usual modified 4-3-3 system and stuck to their normal fluid passing game which had 5-7 men in the area midfield all working together to keep the ball. The centerbacks were vital to Barca’s ball retention today; Madrid started pressing at their half way line so the more advanced midfield players were often forced to play back passes to Puyol and Pique as they could not pass their way through Madrid. Puyol made 34/40 passes before being taken off in the second half; more than the majority of Madrid players. Barcelona ended up with 75% of the possession after the first 20 minutes and 76% of percent possession by the end of the game. Thanks in part to the submissive counter attacking tactics of Madrid and their own good passing. Xavi completed 42/46 passes by the 35th minute while his “counter-part” Alonso completed 8 out of 16 at the same stage of the match. Madrid opted to adapt their system to better cope with the attacking threat posed by Barcelona. They defended with what looked to be a 4-2-3-1 or a 4-5-1 shape; with a member of their defensive triangle of Alonso, Khedira, and Pepe seemingly ahead of the other 2. Madrid’s defensive triangle was compact and they rarely left each other or the backline unprotected. Surprisingly every one, even Ronaldo did some sort of defensive work. Whether it be pressing or covering defensive space. There is no doubt that Mourinho learnt his lesson from the last El Classico; where Ronaldo was left with minimal defensive responsibility. During the first half Madrid’s back line was located relatively deep in their half and the midfield pressed below the half way line. This caused Barca some problems early on and they struggled to work the ball deep into the Madrid half. Despite Barca dominating in possession they always ran more than Madrid, (43.9Kilometers to 43.6 kilometers at around the 30th minute) which shows how effectively and well Madrid covered space. They weren’t force to chase Barcelona around because they had enough men in the right positions. Messi was as dangerous and unstoppable as ever. He played a free role simply drifting around the pitch as he pleased. Troubling Marcelo early on, linking up with the Barca midfield and attack, and making runs at the Real Madrid backline late on. In essence there was nothing Madrid but denie him important space; Messi was a free spirit who moved into space as he pleased. Even though Madrid did a good job of reducing space, Messi was still able to find dangerous space and threaten. Messi had 4 shots, 3 on goal, and 1 of them (the pk) was a goal. He was consistently the Madrid’s biggest threat. It is unusual for such a slick passing team to rely so heavily on balls over the top to create chances, but that was what Barca was forced to do today. Real Madrid defended in numbers, were well-organized, and covered space well. With passing through Madrid’s defensive block no longer a viable option to create chances. 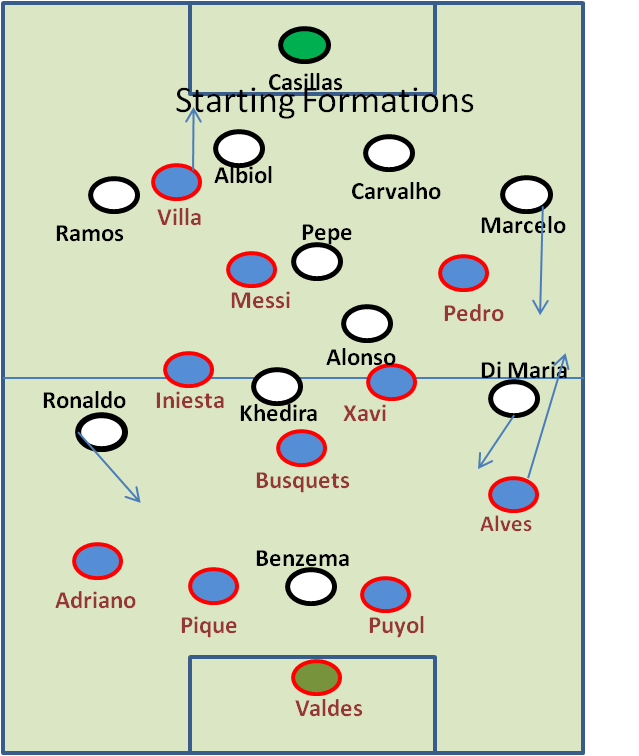 Barca opted to hit a lot of balls from relatively deep midfield positions or in front of Madrid’s defensive bloc. Despite Madrid’s deep defensive line they couldn’t fully contain the acceleration and the passing ability found in the Barcelona team. Barcelona’s passes hit their mark on numerous occasions usually falling to either Messi or Villa; Although Pedro operated close to Madrid’s defensive line he was really quite today and took no shots, occasionally he would drop deep to help Barca keep possession. Villa on the other hand was either on Madrid’s defensive line, getting on the end of a pass and breaking Madrid’s defensive line, or waiting to break past Madrid’s defensive line. He ended with 4 shots on goal with 3 of them on target. Unlike Messi he never got his goal despite being one of Barca’s biggest threats. Barca’s approach finally paid off when Albiol was put in an awkward position, caught between the ball and his man. He brought down his man and Barca got the penalty to give them the lead. Madrid was forced to rely heavily on set pieces to generate a number of their chances as they usually had 1/3 of the possession of Barcelona. The only time they were able to sustain real pressure on Barca during the first 20 minutes, came when they had a spell where they took a lot of corners. Around a 1/4th of their shots came from free kicks (3/13), 2 came from a corner, 1 came from the spot. Their best chance of the first half came through the 45th minute Ronaldo header. When Madrid could counter they often did so down Alves’s flank. He left gaping holes at right back as he went forward, and he was often in such advanced positions he could not get back in time to cover Madrid’s lightening transitions. When Madrid countered they did so with 3-4 players (Di Maria, Ronaldo, Benzema, or Marcelo/member from the defensive triangle. The Penalty kick and Red card changed the tone of the match. Madrid couldn’t commit as many men to covering defensive space as before and still be a counterattacking threat. In response to this Jose Mourinho pushed up his defensive line to the upper portion of his half while still pressing within his half. This reduced the amount of defensive space that needed to be covered and the effectiveness of Barcelona’s balls over the top was reduced because Barca’s midfield players weren’t given as much space to pick out passes. Madrid moved to a 4-3-2 as a result of the sending off and without a defensive midfielder there was more space to be found in between the lines and Messi had his first real opportunities to run and worry the Madrid backline. Madrid defended with 6-7 players after the sending off and counter attacked with 2-3. Usuallywith Adebayor and Ronaldo would stay forward and Ozil would drop back and help cover defensive space. Carvahlo’s was let of his leash and his attacking influence increased as he got forward to support the attack. Madrid committed more men forward after the sending off to prevent losing to their great rivals for the 6th time in a row. It seemed Barcelona had decided that they were going to keep the ball and see out the game between 70th minute and the 82nd minute goal. They kept the passed the ball around in midfield with their 6-7 players. With little attempts to break through for the second. Even though Madrid attacked through open play more in the second half. It seemed unlikely, considering Barca had Madrid in their own half for the majority of the game that the goal would come from Madrid having Bara pinned deep in their half and slicing through with an incisive pass to Marcelo which earned the penalty. Perhaps it was because Barcelona isn’t use to defending in their own-half. Regardless their defensive block didn’t cover defensive space adequately; and that was the main cause off the goal. On the few occasions Madrid had the ball and attacked Barca they seemed vulnerable and unable to cover defensive space. At the end of the day this was a very interesting match with some nice changes in plot. The game looked over after the sending off but Mourinho’s more attacking changes seemingly paid of and a lot of credit should be given to him for preparing his team to play with 10 men against a very strong Barcelona side. Barcelona will be upset with leaving the Bernabeu with only a tie after dominating so much, but that is football.